As soon as I finished Daughter of Smoke & Bone I went through a withdrawal. I had a very hard time looking for a book to top Laini’s writing and characters. I found none. I had to take comfort in re-reading favorite books and let time heal my empty heart. It was really hard to get over it. So a month before Days of Blood & Starlight came out I got the ARC and I was so very excited to read it until I wasn’t. I just couldn’t put myself through it again. I decided to wait and wait and wait some more until it got closer to the third book’s publication date to read it. I kind of regret waiting to read DoBaS. I was a little lost at the beginning with all the names, and some of the terms went over my head. But then it all came back to me. Just like with the first book I was smitten by this world and Laini’s writing. I didn’t think that this one would top the first book, but it did. It was so magical and beautiful. I just loved every little thing about this story. I also don’t know how Laini can manage to make the reader care for small characters. I say this because Days of Blood & Starlight changes POVs often. Sometimes some characters get 2 to 5 pages, and I knew I wouldn’t read about them again, but I couldn’t help but care for them. There's something I have to tell you guys. I have a girl crush on Karou. There, I said it. I always swoon and say how hot the main male character is-Akiva totally is- but Karou definitely has my heart. She’s fearless, she's passionate, and she has blue hair. What else could I ask for in a heroine? I also love where Laini is taking the series. Even thought the book goes from POV to POV and different places in the world(s) it wasn’t messy at all. I was surprisingly in sync with the book. 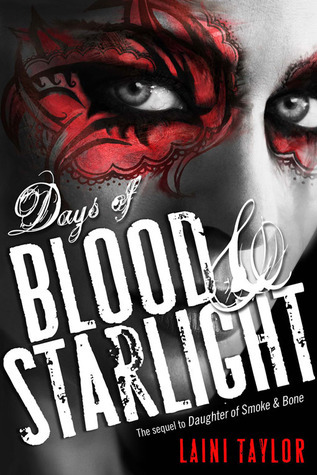 I'm sad that I finished Days of Blood & Starlight. I'm also feeling like I'm going into a Laini withdrawal. But I have Zuzana and Mik's book to look forward to. They are one of the highlights in this book. They made me laugh, swoon and hope. Books like this make me proud of being a bookworm. DOS&B was an amazing fantasy book, the writing was so magical and it was so different to everything else I've read. I haven't heard that this one contains multiple povs, not sure how that would go. Karou is a defiant heroine hehe :) Great review! I am a huge fan of this series. It is one of my fav out there. I know what you mean about wanting to wait to avoid the cliffies, but I read it last fall as I couldnt' resist. I am dying to get the next one. still haven't picked this one up. i just can't bear to wait that long for the next book. Laini Taylor writes magic. she can do no wrong in my eyes. love your chimaera! I didn't purposely wait to read it, but once I wasn't able to read it immediately I figured it was for the better. This way I can read the next one too with not such a long wait. I bought this book when it first came out since I attended Laini's release event. So glad to hear it's terrific! This series is on my TBR list! It's great to hear such wonderful things about it! I can't wait to start reading them! Great review! I'm afraid I forgot the most important parts of book 1 myself! I'll have to find a decent recap somewhere or reread bits and pieces. I've had this one since the day it came out, but I just can't seem to find the time to read it.